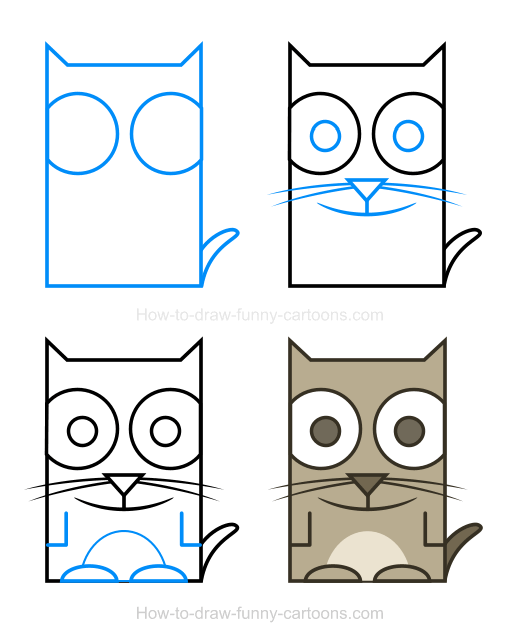 This adorable kitten clipart can be drawn easily using all four steps described on this page! 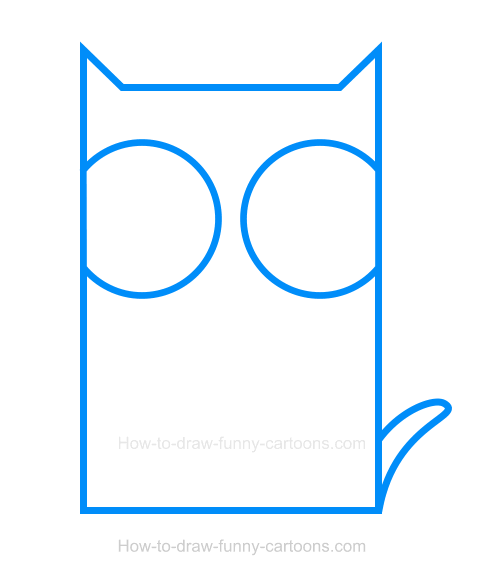 You can either use a vector application to complete this drawing lesson or simply draw this cartoon animal using a pencil and a piece of paper. Kittens are juvenile cats that are cute, playful and quite popular on Youtube! While they are quite popular at a younger age, some kittens are often abandoned when growing. These little creatures are extremely dependent from their mothers during the first few weeks. Below you can see the final illustration once all shapes are drawn. 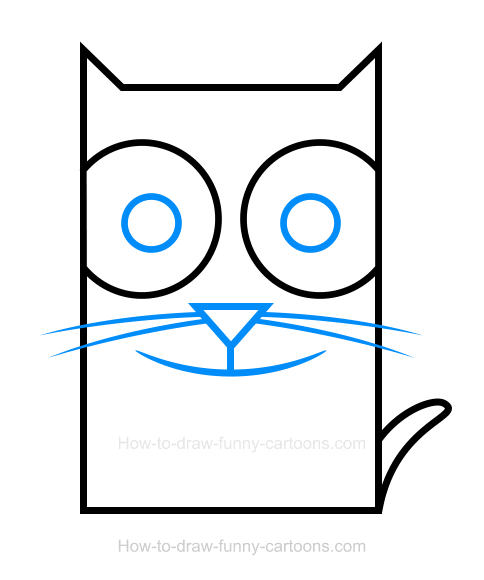 This cartoon character is easy to duplicate and color once you are familiar with all four steps needed to create this animal. Let's start this lesson now! First, draw the body of the kitten using a large rectangle. On top of this shape, draw two small triangles to form the ears of the animal. 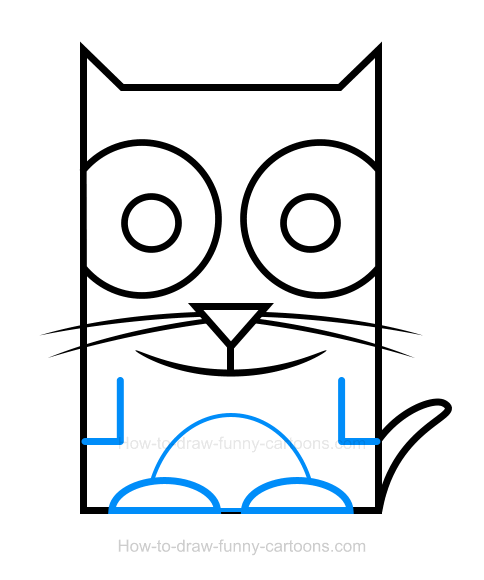 You can use a thick outline to make the drawing even more adorable. Then, add a tail using curved lines. Finally, you can draw two large eyes using circular shapes as shown below. Next, you can draw the pupils using smaller circles. The nose is done with a small triangle made from pointed ends. Whiskers are done with simple lines. The mouth is made from a large curved line and another small line is used to join the nose and the mouth together. The character is filled with a light grey/brown color. The tail, the pupils and the nose are filled in with a darker version of the same color while the patch on the stomach is colored with a lighter version. The eyes are white. You've done it! 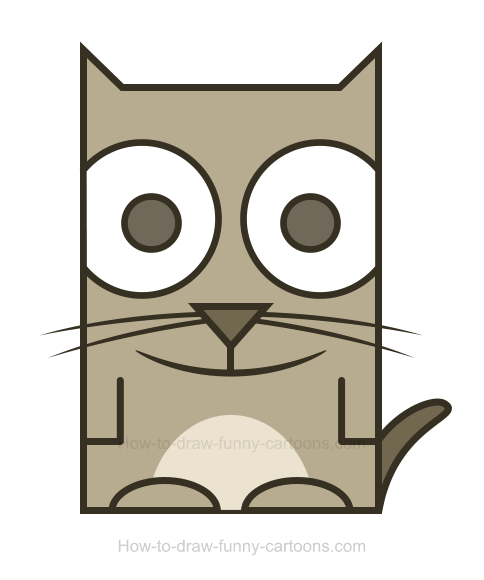 A simple and cute kitten clipart!